Directions: When Missouri State Guard Major General Sterling Price began his move against the besieged Federals, he established his headquarters [ Waypoint = N39 11.135 W93 53.013 ] in the building located at 926 Main Street in Lexington Missouri 64067. Go back to 16th Street and turn right (south) onto 16th Street. Proceed about 0.2 miles and turn right (west) onto Main Street. Proceed about 0.3 miles to the center of town. 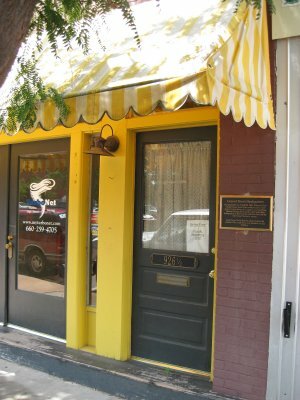 926 Main is located just west of the intersection of 10th and Main Streets on the north side of Main Street. Stop and find a place to park. Description: After his ammunition and supply wagons arrived on September 17th, Price ordered the Missouri State Guard to move into town in preparation to invest the Union fortifications. 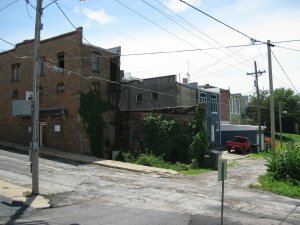 Price would establish his headquarters at the corner of Tenth and Main Streets. The roof of the building would provide an excellent view of the fighting over the next three days. 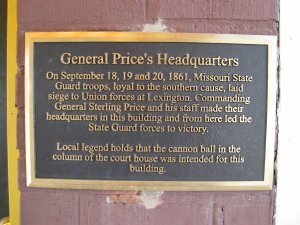 "General Price's Headquarters. On September 18, 19, and 20, 1861, Missouri State Guard troops, loyal to the southern cause, laid siege to Union forces at Lexington. Commanding General Sterling Price and his staff made their headquarters in this building and from here led the State Guard forces to victory. Local legend holds that the cannon ball in the column of the courthouse was intended for this building."